Only about 20% of the cholesterol in your bloodstream comes from the food you eat. Your body makes the rest. Cholesterol has a bad reputation, thanks to its well-known role in promoting heart disease. Excess cholesterol in the bloodstream is a key contributor to artery-clogging plaque, which can accumulate and set the stage for a heart attack. If you eat only 200 to 300 milligrams (mg) of cholesterol a day (one egg yolk has about 200 mg), your liver will produce an additional 800 milligrams per day from raw materials such as fat, sugars, and proteins. Since cholesterol is a fat, it can't travel alone in the bloodstream. It would end up as useless globs (imagine bacon fat floating in a pot of water). To get around this problem, the body packages cholesterol and other lipids into minuscule protein-covered particles that mix easily with blood. These tiny particles, called lipoproteins (lipid plus protein), move cholesterol and other fats throughout the body. Chylomicrons are very large particles that mainly carry triglycerides (fatty acids from your food). They are made in the digestive system and so are influenced by what you eat. Very-low-density lipoprotein (VLDL) particles also carry triglycerides to tissues. But they are made by the liver. As the body's cells extract fatty acids from VLDLs, the particles turn into intermediate density lipoproteins, and, with further extraction, into LDL particles. 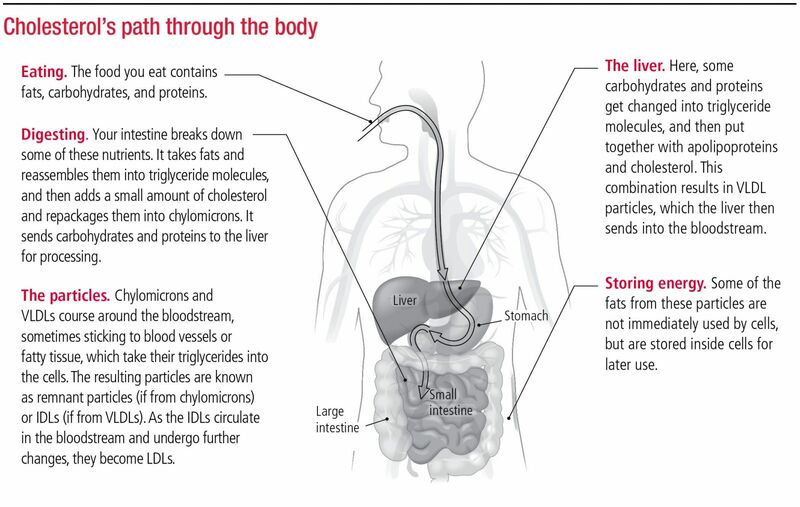 Intermediate-density lipoprotein (IDL) particles form as VLDLs give up their fatty acids. Some are removed rapidly by the liver, and some are changed into low-density lipoproteins. Low-density lipoprotein (LDL) particles are even richer in pure cholesterol, since most of the triglycerides they carried are gone. LDL is known as "bad" cholesterol because it delivers cholesterol to tissues and is strongly associated with the buildup of artery-clogging plaque. High-density lipoprotein (HDL) particles are called "good" cholesterol because they remove cholesterol from circulation and from artery walls and return it to the liver for excretion.